- Private Heated Pool - Pool heating is available October 1st through May 1st for additional fee. 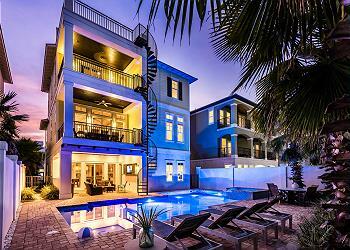 LOCATION: This home is located in Dunes of Destin & is 1 block from the beach. 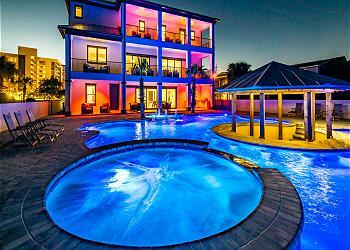 DETAILS: Discover the Alluring Seas during your stay in this incredible Dunes of Destin home! This designer-decorated property features a third-floor oceanview rooftop deck, a private heated pool, and sleeping accommodations for 24 guests. Entering the front door, guests are greeted with the refreshing and airy ambiance inside the entryway. The first floor offers two immaculate guest bedrooms. The first bedroom features a beautiful king bed and a shared bathroom. The second guestroom is a bunk area featuring two sleek and stunning queen-over-queen bunk beds. The first floor living room offers great seating arrangements, as well as access to the outdoor living space. The outdoor living area provides a wonderfully relaxing oasis. Enjoy a refreshing swim in the private pool, or dine al fresco on the outdoor dining set with delicious meal from the built-in gas grill. The second floor features the main living area, exquisitely decorated. A spacious open-concept floorplan allows guests to easily flow from the kitchen area to the dining space to the living room. Chefs and foodies in your group will love spending time in the gourmet kitchen, which boasts expansive white custom cabinetry, an exquisite navy kitchen island, marble countertops, and top-of-the-line stainless steel appliances. The adjacent dining space offers seating for 10 guests, with additional seats at the breakfast bar. This floor also features two king bed guestrooms, each with balcony access, as well as a private bath. The third-floor sitting area presents a quiet place to relax. Four guestrooms await on the third floor, offering a variety of sleeping arrangements. The bunk room is a perfect place for the younger guests in your group, with two twin-over-twin beds and a private bathroom. The final three bedrooms on this floor are perfectly appointed king guestrooms—two offering a private bathroom, and the third bedroom featuring a shared bathroom. Enjoy morning coffee or sunset cocktails on the rooftop deck, which features magnificent coastal views. Your luxury 30A getaway awaits—book this incredible property now by contacting 360 Blue! AMENITIES INCLUDE: 8 adult bikes, gulf views, heated pool. This property comes with 6 private parking spots. Complete Clean Linen Participant - ALL linens, including comforters laundered upon every checkout. This place is amazing and peaceful for all. There’s every reason to stay here again. Everyone has their own space but then we all came together when it was time on 2nd floor which we call the family hall. The experience is really priceless. May I include the upper room experience where you can stand on the rooftop patio and watch the sunset looking at the beach side. This is the moment you been looking for right here at this stay. Thank you for sharing your gorgeous and comfortable beach home with our group of 15. We enjoyed the heated pool/spa and the close proximity to the beach. We appreciated your prompt response to minor requests and the communication thru email and your APP was superb! This house exceeded our expectations!! Was very well kept and extremely spacious and perfect for multi family vacationers. Plenty of towels and clean linens were provided. One room had sand in the bed but the rest was very clean. Enjoyed and took advantage of all the amenities. kitchen was well equipped and had everything we needed. Very close to the beach and easy to access. We were greeted with a stocked fridge of water and complimentary voucher for a bottle of wine and 2 beach blankets. Ambience was very inviting.... luxurious and cozy. Only downside was that we wished the rental included at least complimentary beach chairs and umbrella for our stay. For the amount that we paid, that would've been nice to have included. Maybe a few board games could be provided. Overall, this was a great stay for our multi family. We would definitely come back and highly recommend it to everyone else who's visiting!!! We are so thrilled that you enjoyed your stay with us in Destin! We agree that this home is perfect for large groups or families. We look forward to seeing you again soon! What a beautiful home with everything you need! From the minute you walked in you feel at home! We had a party of 18 and there was plenty of room for everyone to sleep and gather This house is beautifully decorated and is in a perfect location with plenty of parking for your group. Located less than a block away from the beach, blocks from shopping and restaurants, just a few miles from the harbor boardwalk and all The bars. Any time we contacted the property management they got right back to us. Only thing that I can think of that the house needs is safe in each bedroom for locking up your jewelry and wallets. I highly recommend this home and location! We are delighted that you enjoyed your time here in Destin! We agree this home is breathtaking and is beyond accommodating for large groups! We appreciate you giving your time to review this home and we hope to see you again soon!